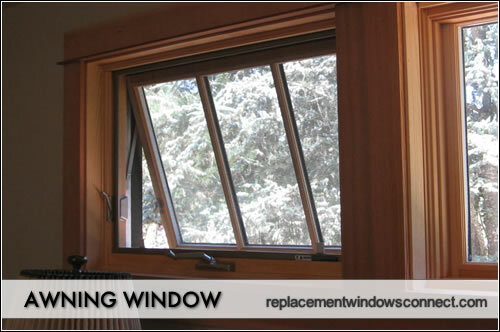 Awning windows offer a unique look as well as specific functionality for a home. They are typically horizontal, rectangular windows that are hinged on the top so that the window can open outward from the bottom. When opened, they resemble awnings – thus, the origin of their name. One of the biggest draws to these types of windows is the ventilation that they offer – they can be left opened to allow in fresh breezes, even on a rainy day, because the top of the window is shielded from the rain by the glass and frame. When most people think of awning windows, they think of a rather traditional look. This is because awnings were often used in older homes before the advent of widespread air conditioning. Since they provide a good deal of ventilation and air circulation, they were a popular window option in homes that required natural cooling. But despite their traditional beginnings, they can also provide a contemporary look to any home. In more modern homes, they are often used in conjunction with other windows and doors, such as transom windows. This provides additional illumination as well as ventilation to the home. Awnings offer a unique look in that they are typically wider horizontally than they are vertically. In contrast, most other styles are longer vertically than they are wide. This unique shape makes them perfect for positioning over doors, where they are often found. They can also be installed over casements, single-hung, double hung windows to create a more interesting and complex look. Awnings are hinged on top so when the handle is twisted, they open outwards from above. This allows lots of light and fresh air in, and offers the possibility of remaining open even during a light rain without worrying about water getting in. They are similar to hopper windows, but with basically the reverse functionality – they are hinged on the bottom and tilts inward from below to allow air in. By design, awnings are very energy efficient. They utilize compression seals on three sides of the window – on all sides except the hinged side. In contrast, windows that move or slide, such as double-hung windows or gliders, only have compression seals on two of the window’s sides. Compression seals form a tighter and more energy efficient seal than other types of window seals. Similarly, casements also offer compression seals on three sides and are relatively more energy efficient than other window models. Find out more on awning window prices. Vinyl awnings are one of the least expensive choices and are a very popular option due to their price, as well as their low maintenance requirements. They require no painting or staining, are durable, and they are resistant to insect and water damage. Aluminum is among the strongest frame choices and is more often used in commercial construction. Some homeowners select this option for use in basements, but they are less commonly seen in other parts of the home. Wood clad frames are the most expensive, but are still a very popular option due to their good looks. Since awnings are typically not as expensive as other types of windows and are used in locations where they are an accent piece, many homeowners opt for the added beauty that wood offers. This does come with added maintenance requirements as well. Homeowners can choose from various replacement glass, glazing and coating options to offer different looks, increased energy efficiency, reduced sun damage and improved security. You can select from clear or frosted glass options (frosted glass is a good choice in locations where you don’t want people to be able to see in, such as in a basement apartment), and can even choose non-breakable or bulletproof glass if you really need that much security protection. You can select from various low-e coatings to offer greater energy efficiency, as well as gas fills. You can also change the look with permanent or removable grilles or mullions. Continuous hinge hoods help prevent water from leaking into the window when it is open during the rain and molded sash corner guards made from nylon also keep water out. There are various handle types that make it easy to operate the windows and adjustable stays that allow you to regulate how much the window stays open. Most awnings come with screens to keep insects and debris out while letting fresh air and natural light in.